An environment group called Knitting Nannas of Toolangi is taking a complaint of intimidation to police after a logging truck drove past one of their gatherings at an "unacceptably high speed" last week, north of Melbourne. When members of the group posted photos of the truck on Facebook, it sparked a torrent of abuse from pro-logging advocates, including a photo of giant tree on the back of a logging truck. 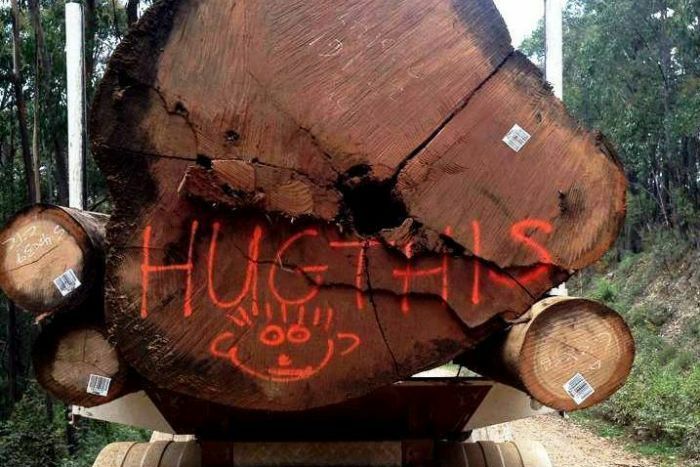 The log, believed to be four or five metres in circumference and hundreds of years old, had "hug this" painted on it, a reference to the term "tree huggers" which is often used to describe environmental campaigners. The photo sparked outrage amongst environmental campaigners. A spokeswoman for the group, who have campaigned against the logging of environmentally sensitive logging coupes in the area, said the photo showed a "lack of respect" for anyone who opposed logging. The spokeswoman asked not to be named because of fear of reprisals. She said the group was formed to stop intimidation from pro-logging groups. "We're now being subjected to the same treatment," she said. Members of the Knitting Nannas said they were taking their complaint to police in hope the intimidation would stop. Jill Redwood from another group, Environment East Gippsland, said it was the loggers "giving the finger" to environmental groups. "It was recklessly provocative and shows total contempt for community values and the concerns about our forests," she said. "It was put up the same day I and two other groups were meeting with department [Department of Environment, Land, Water and Planning] to start process of working out giant tree prescriptions [to protect them]," she said. Loggers are not supposed to cut down any tree over nine metres in circumference. Nathan Trushell, of VicForests, the state-owned business responsible for logging, said it does not "condone this type of behaviour." "We are following up with the contractor concerned to address the issue," he said in a statement. "Our contractors are very responsible in the way the conduct themselves but this was a clear error in judgement from the individual involved. "We apologise to anyone who was offended by the photo." The politically sensitive and critically endangered Leadbeater's possum, which is also happens to be Victoria's animal emblem, is again proving a challenge with the discovery of dozens of new colonies in forests on Melbourne's northern doorstep that are open to logging. In recent months government and community surveys have found 71 new colonies of Leadbeater's possum in the central highland forests. That has prompted dozens of new 200-metre logging exclusion zones to be established across the patches of forest in the state's central highlands where the possum populations are being discovered. The new colony finds are documented in a progress report on state government efforts to protect the possum, which were first launched by the Napthine government (in conjunction with the timber industry and Zoos Victoria) after community and scientific concern for the creature's fate reached fever pitch. The plan's goal is to find 200 new Leadbeater's colonies in state forest within two years. In April the Andrews government announced it was going to speed up the surveying program. By September, 71 new colonies had been discovered. And a further 45 new colonies were also found in national parks, which already exclude timber harvesting. Environment Minister Lisa Neville said the discovery of 116 colonies across state and national parks was "encouraging" and it was pleasing to see progress made "though a collaborative effort across government and with the community". But Sarah Rees, from the green group MyEnvironment, said new discoveries were well short of the target and "deeply concerning". "They have looked everywhere, like our teams," she said. "We are now seeing most of the remnant possums in logging zones and this is what scientists and survey teams have been saying for years." A spokesman for the state-owned timber company, VicForests. said it was "incredibly positive" to see more than 100 new detections of a critically endangered species and survey work was continuing with areas being protected to ensure harvesting did not impact on possum colonies. The report says 188 protection zones have now been put in place to protect the newly found colonies, along with another 283 that were already known. But scientists from the Australian National University have previously criticised the 200-metre protection areas as too small to be effective, arguing they need to be one kilometre to ensure the animal's safety. The government's progress report also says that logging has been delayed in areas where there is a 65 per cent chance of the species living there, meaning harvesting of 14,800 hectares of forest has been deferred for two years to allow more surveys to take place. The report also monitored whether Leadbeater's possums were nesting in artificial hollows that have been created, which replicate their natural habitat in old trees, finding about 25 per cent were being used. 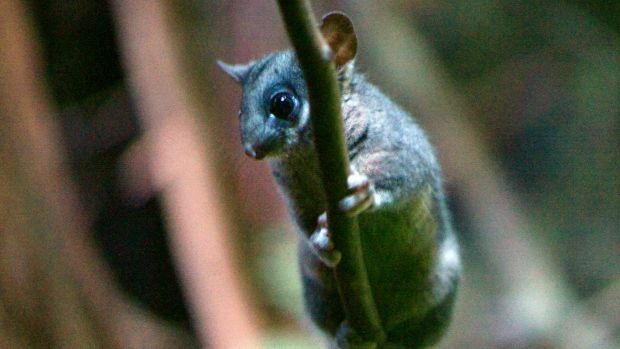 It is still unclear how many possums the newly discovered colonies contain. And there is significant debate about how many Leadbeater's possums still live in the wild overall, with different estimates ranging below 2000 to as high as 11,000. But the decline of the species due to bushfires and logging pressures prompted federal Environment Minister Greg Hunt to this year boost its threatened species status to critically endangered, which is one step before extinction.